The joy of “Joy” is that Jennifer Lawrence is on screen for 95-98% of the time, otherwise the movie is too busy and has too many unnecessary characters such as the Isabella Rossellini’s role which supplies one way to forward the story but adds a lot of nothing to an expanded role. The best part of the movie are the scenes involving Bradley Cooper as he and Lawrence just have a natural chemistry no matter what roles they play opposite each other. Following close are the scenes with Edgar Ramirez as her ex husband still living with her and their two kids. Also living with them are her mother, Virginia Madsen, her father, Robert De Niro, andf her grandmother, Diane Ladd who narrates the movies. Also in supporting roles Elisabeth Rohm as her half sister, Dascha Polanco as her best friend, Melissa Rivers as her mother Joan along with soap opera icons like Susan Lucci, Laura Wright and Maurice Benard fill in the story with the latter three stretching out the film making it seem longer than it really is. The movie is ‘based on a true story’ about Joy Mangano’s inventing the self-wringing Miracle mop and all it took to make it a success from appearing on the QVC channel, being duped by men regarding business, her going into monumental debt and finally standing up for herself. As it is the film is very chaotic with all the family members, the business and TV angle, independent woman in the 1990s, instead of concentrating on that plus her ex, their kids and how she handles all that plus fighting in a business world. 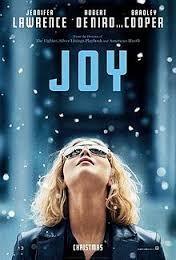 Jennifer Lawrence continues to show her expertise as an actress in playing various roles and doing a good job in each and though she is excellent in “Joy”, the movie itself, as directed and written by David O. Russell, it is not up to her capabilities.